Hope's Cafe: Mountain Hardwear Review and Giveaway! Ever heard of Mountain Hardwear? They're a company with some really great products for anyone who spends a lot of time outdoors-hiking, camping, backpacking, etc. Jack Gilbert, a practiced fly fisherman who is the former VP of Sales and Marketing at The North Face and former President of Sierra Designs. Paul Kramer, also from Sierra Designs, an enthusiastic backpacker and snowboarder with numerous patents that demonstrate his love for pioneering design developments. Mike Wallenfels, an experienced climber and mountaineer, whose Adventure 16 sales experience gives him strong insight into what consumers really want. Paige Boucher, an avid backcountry skier with strong marketing experience from her years at Sierra Designs. Founding Mountain Hardwear was the team's first demonstration of radical thinking; the company bet on experience and passion for innovative, technologically advanced products to bring together a product line within 90 days. Many in the industry thought the task was impossible, but the Mountain Hardwear crew worked fast and smart—and introduced two products that are still in the line today: the Exposure™ Parka and the Sub Zero™ Jacket. More than a decade later, Mountain Hardwear has grown quite a bit. The company has over 90 people in our California office, more than 35 sales reps and associates across the United States and Europe, and representatives in Canada, Asia, South America, Australia and New Zealand. And now, with the solid financial backing of Columbia Sportswear, Mountain Hardwear is free to develop even more cutting edge designs and products." 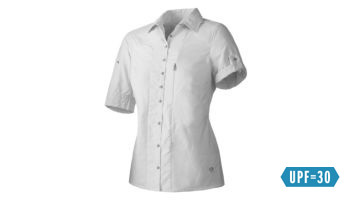 I was able to review the Women's Canyon Short Sleeve Shirt in Pansy. This is a really neat shirt developed especially for women who are out in the sun a lot. Special features include a flip-up sun protection collar, mesh back and side panels for more breathability, UPF 30 sun protection, and a zip pocket for your map! I love having that extra hidden zippered pocket! I've worn this shirt a couple times just out running errands, and it is so handy for putting receipts and money in too! The fabric is a very lightweight, cool material that is great for the summer heat. It also has roll-up sleeves with a button tab, so if you prefer your sleeves up a little higher, you can easily adjust them (I usually wear the sleeves buttoned up). The material is very comfortable, and well-suited for hiking trips! Our family loves to camp out, and that generally involves a walking/hiking trip too. This is the perfect shirt for those occasions! Comfortable, cool, provides sun protection, and has a zip pocket for the trail map! If you're in to hiking/camping at all, I seriously reccommend you check out Mountain Hardwear's selection of great products! In adition to apparel for men, women and children, they also sell tents, sleeping bags, backpacks, and other necessary accessories. Mountain Hardwear is giving a Women's Canyon Short Sleeve Shirt in the winner's choice of color and size! Go to Mountain Hardwear and tell me another product you like! Disclaimer:I received product for the purpose of review. All thoughts and opinions are mine. All quotes taken from the Mountain Hardwear website. I like the Canyon long sleeve shirt in Kiwi. I entered your Lily Brooke jewelry giveaway. I enterd the scripture designs notecards giveaway. I also love the Women's Tonga Hoody! I also entered the Personalized Name Bracelet Giveaway. I like the Women's Geist Vest. Hello, I like their Women's Cortina Falls Pedal Pusher. Thanks for a great giveaway! I would love to have the Viperine II tent. I entered the Hillhouse Natural Reed Diffuser giveaway. I'm following you on twitter as BlogrollPLease. I also like the Women's Rappel T Cap Sleeve. the WOMEN'S SUB ZERO SL HOODED JACKET looks like something i need... i hate being cold! I like the Wicked Life short-sleeved tee! I entered the Fibers giveaway. I like the Girls Jacket! Please enter me. This is so cool! Thank you so much for sharing this. Keep it up!